With an elegant snout, large eyes and a long sleek, brilliantly blue body, the blue shark (Prionace glauca) radiates grace and beauty. 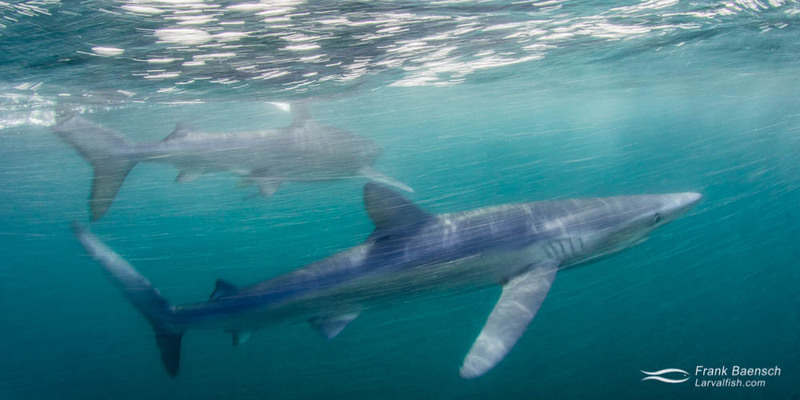 Blue sharks are circumglobal—they are found around the world in many different environments. They prefer cooler waters between 40–70°F and migrate long distances, such as from New England to South America. Relatively fast-growing and capable of producing large numbers of offspring, they mature in 4–6 years and have litters that average 35 pups. Squid constitutes a large part of their diet, but they also hunt octopus, fish, lobster, crabs, and even sea birds. Breeding populations are found off the New England coast during the summer months. L: Fishing fleet in Point Judith Harbor of Refuge. R: Lobster traps. No Food. No Photos. Contrary to popular belief, sharks usually want to avoid humans and need a reason to come within camera range. Using a boatload of bait usually does the trick. Once comfortable with seeing me in the water, the shark’s curiosity took over. Baiting a blue shark (Prionace glauca) up close. I was lucky to see a blue shark being tagged. By tagging sharks, we can study their behavior and movements. For example, tagging data has revealed that female blue sharks off New England travel eastward across the North Atlantic to pupping grounds off Spain, Portugal, and the eastern Mediterranean. Male blue sharks likely remain along the American coast during the winter. Knowing migration patterns helps prioritize areas for protection and determine where sharks are most likely to interact with fishing activities. The physical examination of the shark took about 15 minutes. The gills were continuously ventilated with water during the entire process. The team attached a satellite tag on the dorsal fin, took measurements and blood samples, and removed old fishhooks. Blue shark exam and tagging. TL: Blook sampling. TR: Ventilating the gills. MR+B: Hook removal. Hook, hooks and more hooks. About one in six sharks had been previously caught. By-catch of longline and driftnet fisheries kills about 20 million blue sharks every year — more than any other shark species. Once the most common shark in the open ocean, blue shark populations are now designated as “near threatened”. Blue shark (Prionace glauca) with fishing hook on the side of its mouth at twilight. Sharks are important to maintain the health of an ecosystem and its genetic diversity. As top level predators and scavengers, sharks remove sick and weak animals and keep animal populations lower on the food chain from over-consuming their resources. Shark tourism is big business worldwide. A shark is worth up to 200 times more alive than dead. Yet, they remain unprotected. Baiting a blue shark (Prionace glauca) chasing bait. Blue Shark (Prionace glauca) at dusk with fishing hook. Rhode Island. Mako shark fins drying on a pier off Port Judith, Rhode Island. Motion blur of two blue sharks (Prionace glauca) on the surface off New England. A blue shark (Prionace glauca) biting a piece of blue fish. Rhode Island.